We decided to get up at 5 am and make it down to the Petra visitor center for 6 am when it opens. There is a small but very informative museum there (free) which we visited the night before. We wanted to stake everything out to be fully ready for our big Petra day – something that we have been looking forward to for a really long time. 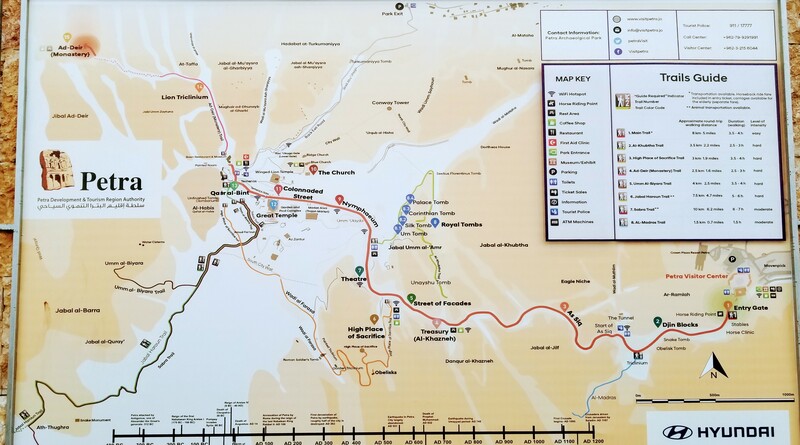 We had pre-purchased the basic Jordan Pass (prior to entering Jordan) which covers most tourist attractions and the Jordan entry visa +1 day in Petra. 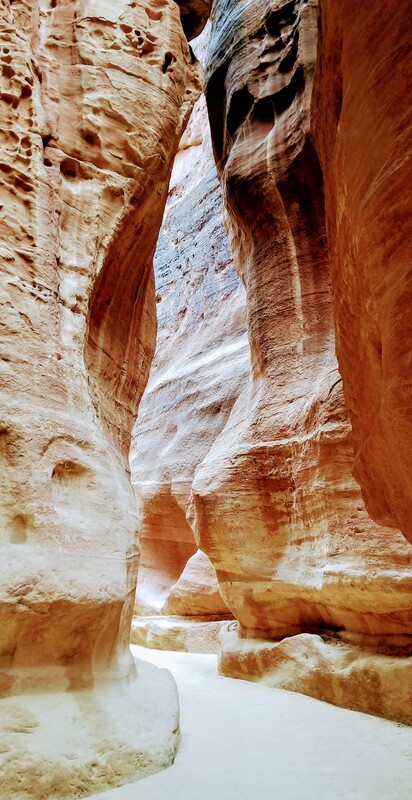 There is an option to add to your 1 day in Petra and purchase an extra day for $5/day up to 2 extra days. From the visitor center the walk is a gradual decent on large gravel paths narrowing into a limestone tight curved slot canyon stretching up 250 ft (76 meters) known as the Siq leading closer and closer to the Treasury. Through the Siq we could finally see the Treasury in the distance – a breathtaking view – especially since there was only a handful of people around us. We really had this magnificent treasure to ourselves, sharing it with a few camels and some hungry puppies (which of course we fed). Carved directly into the red, pink and white limestone this Nabataean city prospered from at least 312 BC (no one knows it’s exact founding) through it’s trade in frankincense, myrrh, and spices evading capture by the Romans until it finally fell to them in 106 AD. The Treasury is almost 40 meters high and intricately decorated with Corinthian capitals, friezes, figures and is crowned by a funerary urn, which according to local legend conceals a pharaoh’s treasure – which it doesn’t – it is solid stone. From the Treasury we walked down the Street of Facades towards the Theater. We stopped at some of the Royal Tombs, marveling at all the hues of red in the limestone forming these stunning pieces of rock architecture. We continued on the Street of Colonnades towards the trail up to the Monastery. The trail to the Monastery is a steep climb of about 850 steps – a 30 minute walk for a fit person and probably closer to an hour for someone less able. There are many shops along the way and stops to purchase tea and water. Reaching the Monastery, we were rewarded with a magnificent view of the largest monument in Petra. In front of the Monastery there is a lovely shaded cafe with seating and trees. They serve tea, coffee and sandwiches which we enjoyed while marveling at the grandeur of the monument before us. Above the Monastery there are two different small hills offering “The #1 View” – both were worth the short climb. After descending from the Monastery we caught the High Sacrifice trail from the north and continued to climb along temples, monuments and caves – one more beautiful than the other. After about an hour we made it all the way up to the place of High Sacrifice. The views were truly stunning. 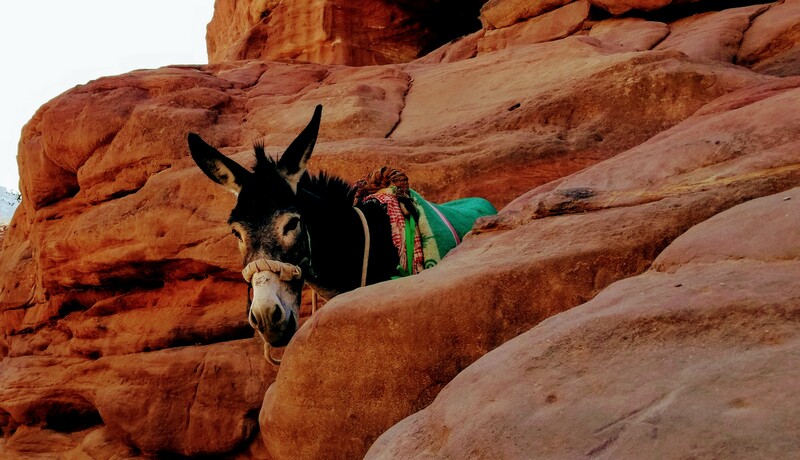 Along the way we met a sleeping donkey – teetering on an edge of a cliff. His owner informed us that there was no alarm and that the donkey “rests” this way daily. 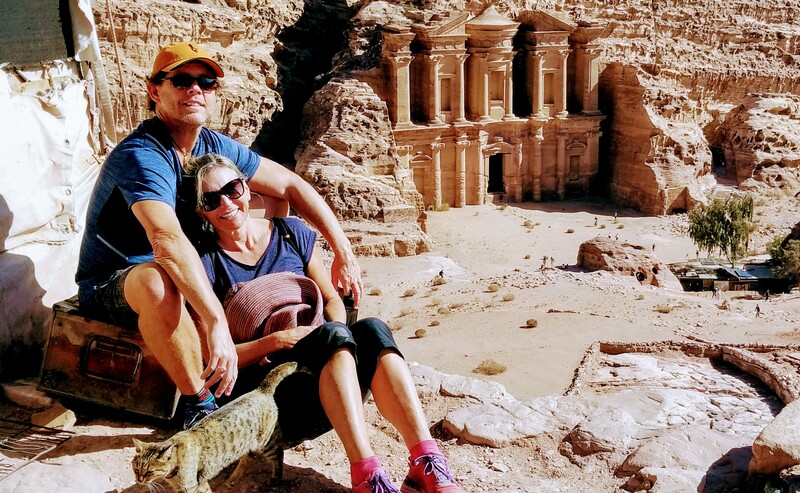 Blown away by all the beautify we had witnessed during the last 10 hours we decided to push on and complete the last trail of Petra – the Royal Tomb trail. Climbing yet again, higher and higher around hills and rocks and breathtaking tombs we were rewarded with the trail ending at a small Bedouin tent which overlooked the Treasury. The sun was starting to set and we were so happy that we were completing this fantastic day with the Treasury once again. After a quick view of the sunset along the way, we made our way back in complete darkness. The site closes at 5 pm, yet we didn’t make it out until after 6 pm and no one seemed to mind. Tired, hungry, exhilarated and enlightened we gratefully walked back to our hotel.